Formula X Studded X: Mini Lip + Nail Polish Duo ($15 CAD) is a duo of a KVD VS Formula X nail polish mini and Kat Von D Studded Kiss Lipstick mini in coordinating colours. There are five sets to choose from, with Coven (lavender, pictured above) and Mercy (deep oxblood) being my picks. Trends in colour and product come and go, but good tools are always a must. I bought the Sephora Collection Advanced Airbrush Set ($80 CAD) years ago, and I still use these brushes regularly. The mix of face and eye brushes is a great choice for someone that is starting to get into makeup or to treat them to an upgrade. The synthetic brushes are soft and won't "eat" cream or liquid products like natural bristles do. My favourite is the concealer brush, which buffs in liquid concealer effortlessly (and was my pick for an "essential" makeup brush!) I also love the foundation brush, although I've been reaching for my Urban Decay Optical Blurring Brush more now. 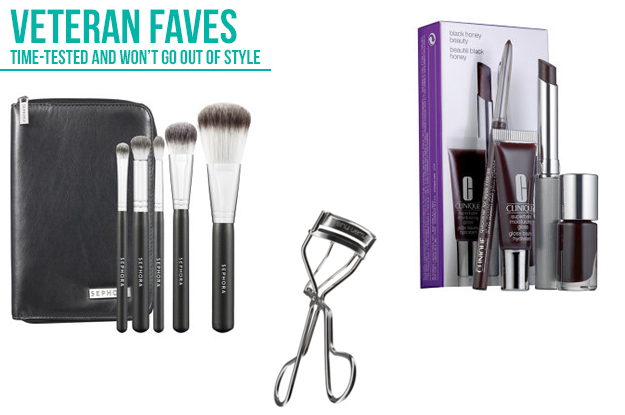 The Shu Uemura eyelash curler ($24 CAD) is a classic and iconic staple for makeup lovers. Once you try it, you (or your giftee!) will never go back to just any old eyelash curler. Enough said. LUSH always has an amazing assortment of gift sets available during the holidays (over 9000 80!) --and already beautifully wrapped up too, which is a bonus if you're short on time or are all thumbs at wrapping gifts. I had a hard time choosing just one to feature, but the Winter Garden set ($37.95 CAD) is my pick. I love the mix of floral and creamy scents, and the variety of products to freshen up from head to toe: Rub Rub Rub shower scrub bar, Snowcake soap, Rose Jam shower gel, Gorgeous face moisturizer, and Dream Cream body lotion--it's like an at-home spa day in a box! I have a slight fixation on Atelier Cologne right now. The Necessaire Azur Gift Set ($32 CAD) includes the four scents from the Collection Azur, inspired by places "where water and sky become one". There's a mix of floral, citrus, and woody scents here to appeal to someone that loves changing up their fragrance. They are intended to be unisex, and having smelled them in store, I can definitely see that. Sud Magnolia leans a bit more conventionally feminine because of the magnolia and black currant, though still wearable for a guy that likes to explore fragrance. For $13 CAD more, you can really spoil someone with four Collection Originale fragrances, plus the four from Collection Azur, in the Necessaire Nomade Gift Set ($45 CAD). Bite Beauty Best Bite Rewind ($29 CAD) is a hot item, periodically going out of stock online and then coming back in. Bloggers have been all abuzz about this set, which features four Matte Crème Lip Crayons in deluxe mini size (slightly more than half of the full-size). I've been resisting my hardest to not buy this for myself because my goodness, Aubergine is crazy gorgeous, and the value (~$69 worth of product!) is really good. I am a big fan of butter London; the polishes are amazing quality and super smooth, and that hint of British charm is irresistible. If you've got a nail polish addict in your life, skip the Sephora Formula X gift sets (excellent formula but the values are actually pretty terrible) and get them the butter London 12 Months of Manis Lacquer Set ($78 CAD) or the Invite Only Lacquer Set ($45 CAD). Each set has a mix of textures (glitters, shimmers, cremes) and colours from soft pastels to bold brights and deep jewel tones. Take it from this nail polish addict: these are the ones they want. This isn't a gift set but an honourable mention for the Tarte Tartelette Amazonian Clay Matte Eyeshadow Palette ($54 CAD). I'm not really an eyeshadow person, but I really like the selection of matte neutral shades in this palette. The textures are soft, buttery, and pigmented. You can't go wrong with this one. That's all for now! I didn't really include skin care for the face here, because I think with all the different "it" ingredients and skin types/concerns, it's super personal. Even though there are a lot of great facial skin care gift sets available, my advice is to avoid gifting it unless it's something you know they really want. 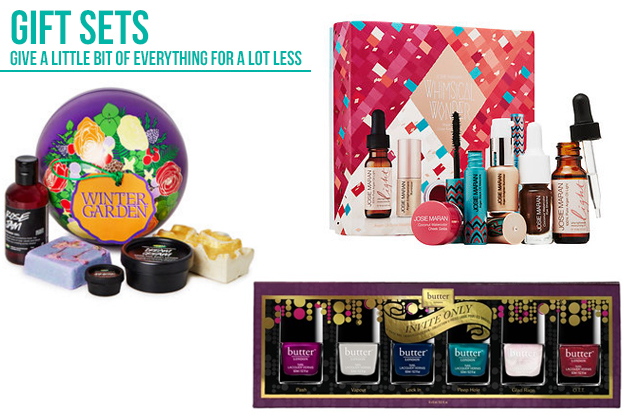 PS I also have a gift guides for men and all things non-beauty in the works! What are you giving the makeup lovers in your life, and what are you hoping to unwrap for yourself this Christmas?